I have so many wonderful artisans to introduce you to, but have been short on time for the past few weeks and would rather wait and give their articles the attention they deserve than just post something mediocre for the sake of posting. Working like a mad woman as always. Creating, thinking, planning, hoping, praying. I've been seeing a lot of success lately and I sure hope it keeps up! I have so much going on this week with Halloween and then the next two weekends I'll be at craft shows... Not sure when I'll get to sleep next! 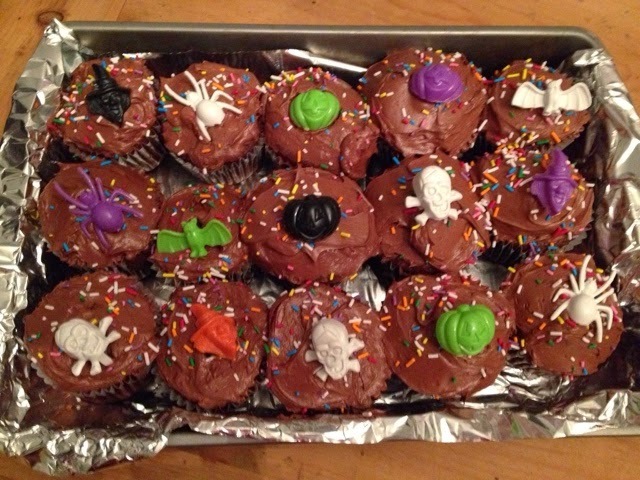 Tonight I baked up some cupcakes for my youngest's class bake sale. Well he pretty much did all the work, but then I took over spooning the batter in as it was getting pretty messy and it was bedtime before they were cool enough to frost, so I finished that off for him. The props are cheap plastic rings from the dollar store, there were like 25 in a bag. The sprinkles are a special touch he'll be very happy about.